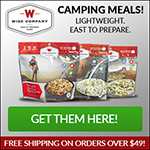 Wise Company provides ready-made meals for emergency and preparedness. The meals have a shelf life of 25 years and allow your family to have enough good, usable food when emergencies strike. In order to reconstitute freeze dried or dehydrated food, it is preferred to use hot or boiling water, which may not be easily available in an emergency situation. Note: Many of the foods from Wise Company can be reconstituted with room temp water if absolutely necessary. Wise Company usually ships very quickly even in high demand times. They provide peace of mind to their customers who are looking to prepare for the worst. The products are also very useful in other situations like camping, hunting, and backpacking. The quality of the food is by far the best on the market. It truly does have a good taste, which is definitely something you want when SHTF. The variety is excellent and accomodates virtually every preference. The food is packaged in airtight Mylar pouches and then arranged in durable buckets for easy storage. The buckets are compact and stackable, which saves space. Click Here To Buy:Buy Wise Company Emergency Food Kits Now! This entry was posted in Gear Reviews, Products, Uncategorized and tagged Dehydrated Food, Emergency Food Storage, Freeze Dried Food, Gourmet Emergency Food, Preparedness, Survival. Bookmark the permalink.